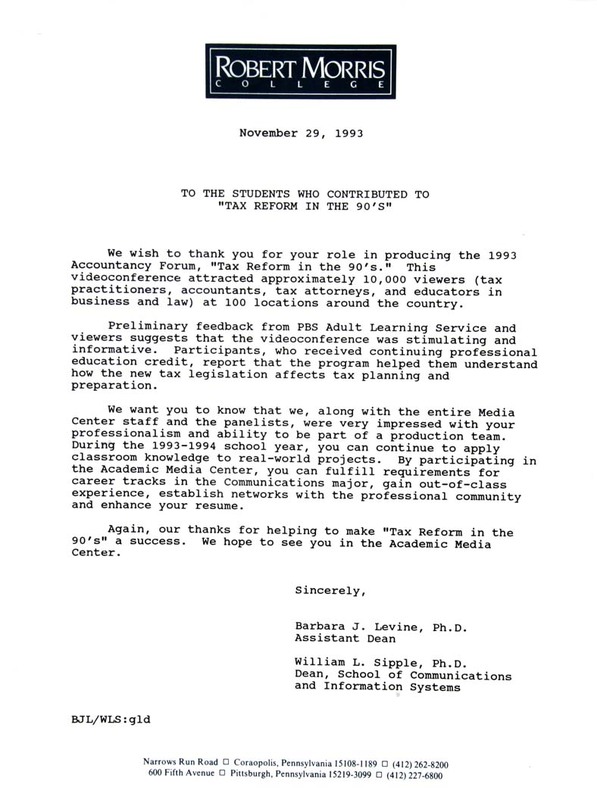 "TAX REFORM IN THE 90'S"
We wish to thank you for your role in producing the 1999 Accountancy Forum, "Tax Reform in the 90's." This videoconference attracted approximately 10,000 viewers (tax practitioners, accountants, tax attorneys, and educators in business and law) at 100 locations around the country. Preliminary feedback from PBS Adult Learning Service and viewers suggests that the videoconference was stimulating and informative. Participants, who received continuing professional education credit, report that the program helped them understand how the new tax legislation affects tax planning and preparation. We want you to know that we, along with the entire Media Center staff and the panelists, were very impressed with your professionalism and ability to be a part of a production team. During the 1993-1994 school year, you can continue to apply classroom knowledge to real-world projects. By participating in the Academic Media Center, you can fulfill requirements for career tracks in the Communications major, gain out-of-class experience, establish networks with the professional community and enhance your resume. Again, our thanks for helping to make "Tax Reform in the 90's" a success. We hope to see you in the Academic Media Center. Barbara J. Levine, Ph. D.
William L. Sipple, Ph. D.